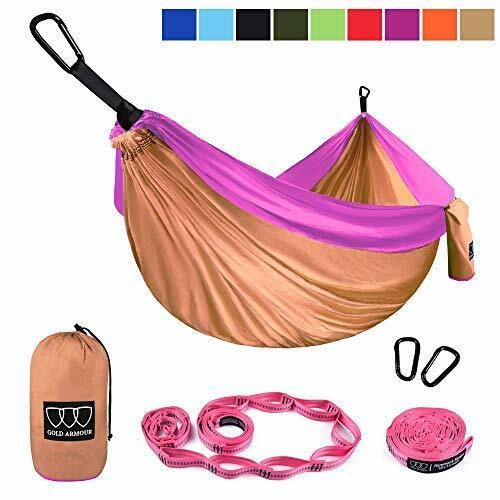 ✔PACKAGE - Includes a single camping hammock 108L x 55W inches, two heavy duty steel carabiners, and two Hammock Tree Straps 10 Feet Long (20 Ft Total) x 1 Inch Wide (Tree Friendly), 16 Attachment Loops (32 Total), 500+ lbs Per Strap (1000+ lbs Total) with No-Stretch Heavy Duty Triple Stitched Seams. ✔100% SATISFACTION GUARANTEE and 15 YEARS WARRANTY - If you don't like your hammock, or whatever, we'll instantly refund your money and you can keep the hammock, no questions asked. It's our promise and we don't lie. 15 YEARS WARRANTY included by Gold Armour, a U.S.-based company. Why do you choose Gold Armour? Hammock: This camping hammock is a 108L x 55W inches SINGLE size hammock. This SINGLE hammock is very soft and comfortable, and made with the highest quality material. Price: Our single size hammock price is only $21.99. Top Quality And Affordable Price Gold Armour products are produced by our factory which has produced many hammocks for international brands. So the quality of our hammock are the same as other famous brand. Material And Processing Characteristics The hammock is made of super strong 210T parachute nylon material. So it’s very lightweight. This soft, breathable and mildew-resistant nylon cloth will last for a long lifetime. We have employed high-grade nylon triple interlocked stitches to maximize hammock strength for your ultimate safety. So the hammock are tested to hold up to 500 pounds. 100% SATISFACTION GUARANTEE and 15 YEARS WARRANTY: 15 YEARS WARRANTY included by Gold Armour, a U.S.-based company.